Like all Spectra pumps, the S1 is a closed system - a physical barrier between the milk and the pump ensures hygiene and motor performance. With a maximum suction strength of 250mmHg and the ability to be used as a single or double pump, plus a host of additional features, the S1 is set to become the ultimate breast pump to support U.S. moms. The suction is adjustable in both let-down and expression mode! Includes a RECHARGEABLE BATTERY, timer and night light. This pump is also really quiet!!
? Helps protect breast milk and baby from bacteria, mold and viruses while pumping.
? Keeps tubing dry by preventing air flow between expressed milk and pump tubing while pumping.
? No need to clean the narrow tubing.
? 2 Phase Cycling with Let-Down Button. Completely Adjustable Suction and Cycling in let-down and expression mode.
? Each mother can customize her pump’s settings to her own body’s response and follow her flow to find her own best settings every time. The Spectra S1 technology makes it possible for a mother to keep the pump set on her maximum comfortable suction level with minimal noise. 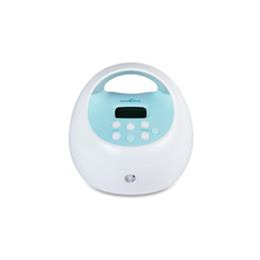 This comfortable and effective breast pump motor only weighs 4lbs! It is powered by and an AC adapter AND Built in Rechargeable battery!